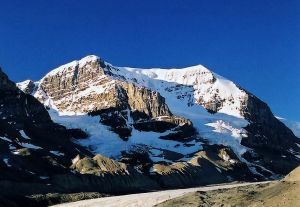 This peak is #20 on the Height List for Alberta .Mount Andromeda is located 2 km west of Mount Athabasca, on the ridge which divides the Saskatchewan Glacier from the Athabasca Glacier. This summit has many technical snow and ice routes. All routes to the summit are exposed and subjected to considerable rockfall or avalanche danger. Name Notes: The mountain was named by Rex Gibson, former president of the Alpine Club of Canada, for the mythological daughter of Cepheus and Cassiopeia. As a young woman, she was chained to a rock as a sacrifice to a sea monster after Cassiopeia had boasted that Andromeda was more beautiful than the nereids. However, she was rescued from this fate by Perseus, who married her. The label is slightly misplaced on the BC Basemap, it is shown to be over the southwest summit, which is not as high as the northeast one.